Tunnel Puzzle HD, a universal app for both iPhone and iPad, and available through the iTunes App Store, is a puzzle game that does what it sets out to do, and although it never breaks new ground, it is a solid and entertaining title. 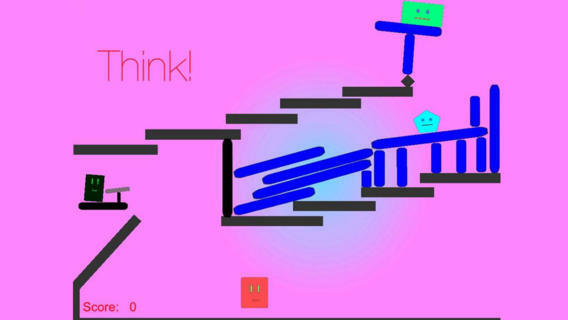 The game is a physics puzzler, where the idea is to get two differently shaped polygonal shapes, Steve and Victoria, to meet on every level. You do this by removing blocks at the right time to set off chain reactions that end up with the two shapes colliding. You have 20 seconds to do this on each stage. For the most part, it works, and each of the 25 levels is suitably different from the last, with some really trick levels in there. The physics are OK, and the game moves well, and everything seems to move in the way it is supposed to move, and I liked the ‘think’ time you get before the start of each stage, which helps you to familiarise yourself with the level, and decide what you have to do. You can complete some stages without ever really knowing what you did, but that is just the nature of these physics based puzzle games, and not something unique to Tunnel Puzzle HD. -Twitter Integration: Tweet from within Tunnel Puzzle! The game looks good, with the shapes looking nice on a Retina display, and the addition of Achievements is most welcome, as it adds a little bit of replay value to the game. The music is good, but repeats itself a lot, and restarts whenever a stage ends, which is quite often when you consider that the levels are only 20 seconds long each. The menus and overall presentation are good, with everything looking professional, although it does suffer from that annoying ‘spinning circle’ between each screen transition that some apps suffer from. Overall though, I enjoyed my time with Tunnel Puzzle HD. A simple and relaxing puzzle game, this comes with a modest recommendation. Hopefully, the developer will add some more stages and sort that music track out, and it will be a much more robust game. Still, worth checking out.